The Newfoundland wind is a constant companion. It is brutal, fierce and speaks in uncommon voices. Alone, Arayo and I walk through a small fishing village. A few houses, a small dock, and a handful of vessels. Graves marked by white tombstones, sharing their eternity, are huddled in a plot together. The wind pushes around the hills, plays off the structures and talks to us in low, painful moans. It hums, like voices from a chorus of the dead. I look around for someone, but know it comes from the wind. Strong and merciless, this wind. A drive up the Northern Peninsula is an exhausting battle against it. My trusty little Subaru struggles to hold her claim to her side of the road, and I find us blown towards oncoming traffic when I temporarily lose my battle to hold her in place. I pity and am in awe of those who choose to drive an 18-wheeler here. I pass the remains of a truck that lost its battle with the wind and was blown off the road. Each time I see a big rig headed my direction I duck as I await the blow that will send it falling onto my car. Along the western coast of the rock, nature has found its own ways of dealing with the wind. Trees resist the urge to grow tall. It is safer to huddle near the ground in groupings so dense that a squirrel would have trouble penetrating further than a few feet into the forest. Those trees that dare reach for the sky live permanently bent from the effort to grow tall. I long to spend a night in Blow Me Down Provincial Park, but they close early for the season. I wonder why? The man on the radio says that wind has again closed the road around Wreck House. Arayo and I slow the car and take frequent stops to walk along the beach, feeling alive surrounded by the fierceness of nature rushing around us. The endless wind which has claimed and shaped this island of Newfoundland. 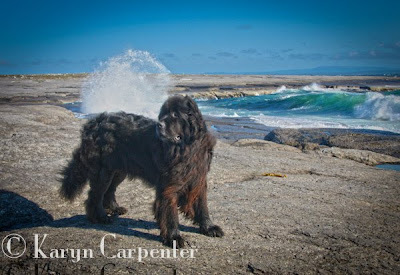 Photo: Arayo enjoys the feel of the wind through her fur on the Newfoundland shore. That dense, stunted growth is known as tuckamore. that park is where we thought we were being blown over into the lake/river nearby in the middle of the night.